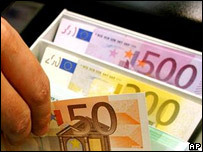 The European Central Bank (ECB) has left interest rates unchanged at 4%, in line with analysts' expectations. Eurozone inflation has risen in recent months, pressuring the bank to keep rates at current levels, despite slow growth and global market turbulence. Official data showed that inflation in the 13-nation eurozone hit 3% in November year-on-year, marking its highest level in more than six years. Earlier, interest rates in the UK were cut to 5.5% from 5.75%. The US Federal Reserve is expected to cut interest rates next week. Fear of rising inflation pressured the bank to keep rates steady. "The period of comparatively high rates of inflation will be somewhat more protracted than previously expected," European Central Bank president Jean-Claude Trichet said. Finance ministers in the eurozone have voiced their concern about the euro's strength, which is supported by comparatively high European rates. German finance minister Peer Steinbrueck has expressed his worries about the currency's strength, which makes European exports expensive to consumers outside the eurozone. And Italy's deputy economy minister Vicenzo Visco said it would be "suicide" not to cut rates. Before the credit crunch hit global markets in the summer, the ECB had been expected to raise rates to 4.5% by the end of the year, but the consensus is now for them to remain unchanged until the end of the year.